We made a valiant effort to get up and out early to work by 8am while the weather was clear, but the rain came down hard by 10am and we had to scramble to the car before we floated away - all I got done was a block-in drawing of the tree I painted yesterday, not even worth posting here. 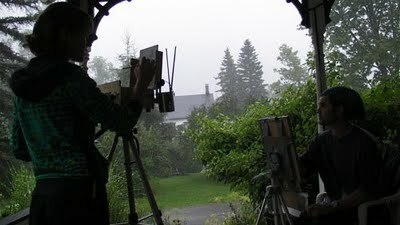 It continued to pour hard the rest of the afternoon, so a few of us set up to work on the porch of the house we are staying in. The above is my drawing of a particularly dramatic tree branch visible in the yard. It's such a great specimen of organic form, I don't know why I ever needed to venture off the porch at all! Tomorrow is supposed to be sunny and warm, our last full work day, so many of us are hoping to get in a final session of working from our primary subjects. Yesterday was a washout - got all set up to work, only got a couple hours into it, and the rain came down so hard everything turned grey/white and we had to call it a day. 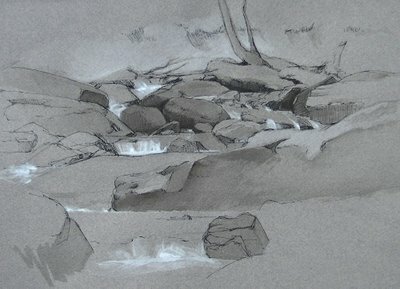 Today Kaaterskill falls was swollen beyond recognition - majestic and exciting, but not at all like the peaceful terraced pools in the study I am working on, so a couple of us decided to head for high ground and do a tree studies instead. 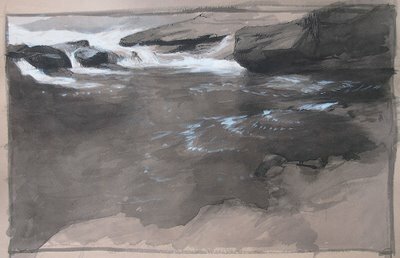 Had a great time with the above painting - and wow it's nice change to be out in the sunshine instead of hunkered down in the chilly mist of the falls! Tomorrow it's a tossup: the plan is to check out the falls and if we decide the waters are still too rambunctious we'll head for the high warm plateau with the lovely trees again. This is the same basic composition I did a couple days ago in color. I decided I need to do a detailed value sketch if I am going to flesh this out into a larger, finished painting. I started with an "open grisaille" yesterday using burnt umber and turpentine (called "open" because the white canvas shows through). Today I started to refine it as a "closed grisaille", using white paint, burnt umber, and ultramarine (called "closed" because when it's done the canvas will be covered with paint). I also started a color study close-up of the pool of water at the bottom of my composition. This is still really unrefined, I wanted to take it further today but I'm using a new type of canvas panel and the wet paint does not stick well when I try to add more layers. I'll be able to take it further another day once the paint has set up a bit. We're starting to wind down to the end here, just a few more days of study here in the Catskills before we all go back to our respective studios. The last day of the Fellowship is this Sunday, August 2; I can't believe it's going by so fast! 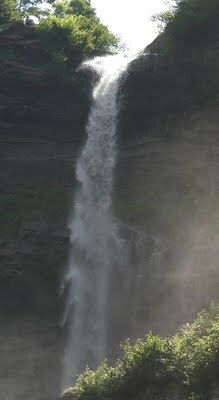 We had a huge thunderstorm last night and as a result the falls were the highest and fastest I have seen them. Recently they'd slowed to almost a trickle in some places. 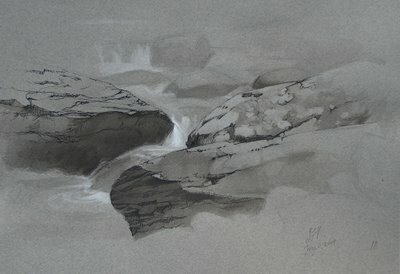 I feel like this section of the falls has become my own studio. I've walked over every one of the rocks here many times now and I know several bends of the river pretty well. When hikers decide to wade in the pools and climb on the rocks, I feel like strangers have wandered into my studio and are touching my props. Above: Block-in line drawing and first part of color wash. Above: Thin color wash, consistency of watercolor. Above: Refining blocks of color and shapes, adding details. Above: Added details and adjusted colors and values. Mix up puddles of the main colors and values with a palette knife before working with the brush. Look, look, look... only put down one single stroke and then look back again at the subject. I know all this so well from my studio work, but somehow outdoors I feel I should be able to get away with slap-dash dabbling. Anyway, it's starting to sink in: I have to be calm and slow and look, even outside. It seems simple, but between the mosquitoes buzzing in my ears, the cold breeze chilling me to the bone, and tourist hikers snapping my photo every few minutes, I have apparently been distracted from everything I thought I knew. Glad it's starting to come back, had a lot of fun today. Eight more hours spent on the boulder study today and I think it's done. Today I went back to Olana today to complete the painting I began last Thursday. Luckily the weather was similar to the previous session. I adjusted the composition and refined the colors and added more detail overall. I also adjusted the shape of the river quite a bit, I think in this version it sits on the plane of the earth more accurately. Last night I arrived from my lovely weekend off refreshed and excited to paint so I ran out and did this sunset. We've grown to quite a crew of sunset sketchers, there were about 10 of us set up on a high flat driveway area perfect for sunset viewing. Jake said he'd been there all day and saw a black bear running - fast - not far away. I don't think I'll go up there alone! 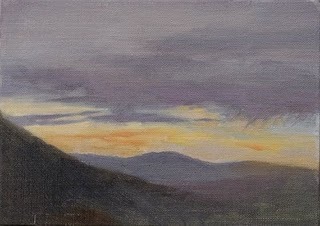 For my first sunset study I went too dark but on this one I over-compensated and went too light. The hue, value and chroma of each stroke would be hard enough to evaluate if the subject were not also constantly moving and changing! It's a frantic 90 minutes of painting, but also pretty exciting. Random excalamations of dismay erupt from one or another painter at regular intervals. Today was rainy in the morning so we drove to Olana, which is the home Frederick Church built for himself on a 250 acre property. He bought the land for the views of the Hudson River and he designed the landscaping to create ideal compositions. Everywhere you look is an amazing scene for a painting. His house in incredible too, a Moorish-inspired castle, full of artifacts from Church's extensive world travels and lots of his paintings. We did a tour of the house and after that the sun was shining again so we decided to stay there and work on the grounds. 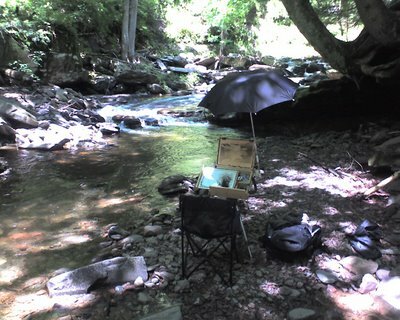 I had my supplies along so I set up my easel and worked for 4 hours on the above study. I'm hoping to go back to Olana and work on it more, the above is just a start. Also, last night a few of us decided to try sunset studies, below is the result of my first attempt - one hour of ever-changing sunset glory that just about drove me mad. 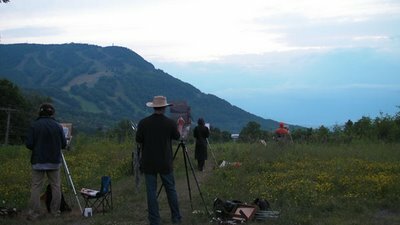 A ravenous swarm of mosquitoes sure appreciated us standing still with hands encumbered by painting tools, and right at dinnertime! 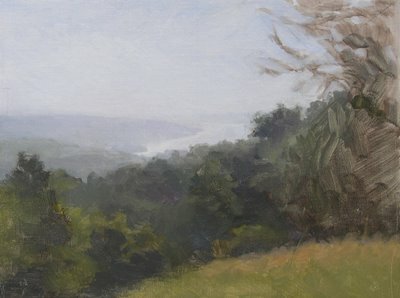 Afterwards I learned from my instructor Edward Minoff that my values (light/dark) are way too extreme and I need to significantly lighten the clouds and everything in the distance. He showed me his study and I could see what he meant. I can't wait to try both again, but I'll be away from the fellowship this weekend to go visit my husband. So I won't be posting for a few days, back on Monday. I'm trying to pick a composition and commit to one scene (or maybe 2) so I can focus my studies towards making a fully developed painting. Having a hard time choosing though, everywhere I look there's something to potentially paint. This was my atempt today but I don't think I'm going to pursue it. It's too complicated to understand what's going on. The fatigue is starting to get to me. Not getting enough sleep, plus hiking/scrambling around in the gorge, plus sitting and working for hours in the cold, are all starting to wear me out! Going to try for 9 hours of sleep tonight... my goal is try to sleep at least as many hours of the day as I paint! 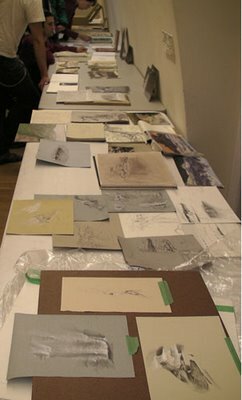 Check out the Grand Central Academy Blog which is documenting more sketches from the Fellows, so you can get a closer look at what's on that long table. 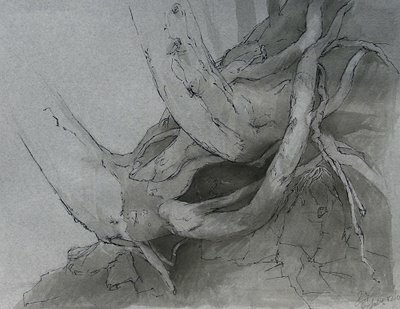 "Two trees with exposed roots"
A closeup-of the upper region of the composition I sketched yesterday. I worked with pen and ink today for the first time and loved it! A diluted ink wash creates controlled values much faster than graphite pencil. I started with a rough graphite-pencil block-in, and then refined the contour drawing with a dip-pen and ink. Then I diluted the ink with water (on a plastic palette) and used a brush to lay in the washes, building up the layers slowly to reach the values I wanted. To see a nice quick overview of the work from previous years go to this page of past Fellows and mouse over each name to see an example of their work. As for painting... yes, I am itching to begin painting in color! But on the other hand, doing these drawings has only emphasized how complicated nature can be, and I know I'll be grateful for having done all the line drawings and value studies when I start grappling with color.